I searched for an answer but came up empty. How do I get my plugins to work in Affinity Photo? I have been able to make them show up in the Filters, but they don't do anything. I would like to be able to use Portraiture, and NIK software to start. There are a couple of answers to your questions. 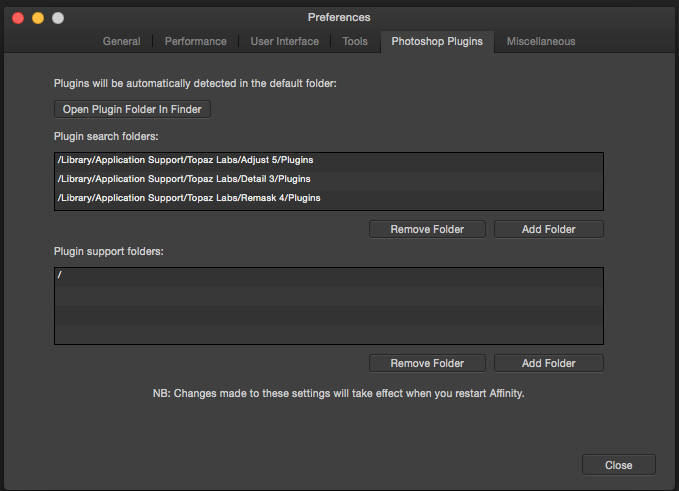 First, you have to enter the paths containing your plugin folders in the Plugins Search Folders section of the Preferences -> Photoshop Plugins dialog box. You clearly have already done this or you would not have your plugins showing up in your Filters menu item. Next you have to enter the support path for those plugins in the Plugin Support Folders section of the same dialog box. As a general rule we have been told to use the / path since the proper path may differ for individual plugins. This should allow you to be able to call your plugins and they may (or may not) work. Plugin support is still an ongoing effort and it has been hit-or-miss. Personally I find that I can call my Topaz plugins and some of them work and some of them do not work. However there is an update coming which we have been assured by the developers will fix the plugin issues. I believe that they have been concentrating on core editor functionality and leaving some of the other functionality to the end. I am reasonably sure that they will have it fully working in the next RC release or the one after that so I expect full functionality within the next week to 10 days. Note, however, that I am only a user, not a Serif developer or forum moderator so I may be wrong about the date for full functionality. Whatever else, the developers have been so good about getting stuff fixed that I am confident that this will be addressed quickly as well. Hope this is of some help. Thanks for the reply! I wasn't sure about what to put into the Support Folders section. I will give this a try. So I understand, you are saying just put a forward slash to indicate starting at the root? Ok, guess I don't know how to select a / path. Just press Add Folder and use the browse dialog box and navigate to the Macintosh HD folder. That is the "/" folder. Thanks, I finally figured it out. Haven't found a plugin that works so far. I will keep trying. Some of my Topaz plugins work. Adjust and Detail work, Clarity causes a crash and ReMask will not run. However Topaz offers a plugin all to run the other plugins (photoFXLab) and this not only works in APB but allows me to successfully call all of my other Topaz plugins. I tried the NIK stuff but could not get it to work on my system. The Photoshop plug-in support is currently being improved. Things should get easier with the next Photo updates. Thanks for the update. I've found that, like MikeFromMesa stated, some plugins work and some don't. I am very happy with the progression of this software. It will be so great to not need Photoshop any longer! Noiseware Plug-In only shows a Black & White previou. Nik Collection will not work properly. My experience: Nik plugins are hit and miss (eg, HDR is fine & Define does not work), Portraiture does not work. MacPhun Tonality Pro, brings up attached box and freezes the app - Force Quit required. PS This is on the MAS release app - not the Beta. I have entered the path to Imagenomic Portraiture into AFP prefs, and a greyed out menu item appears in the plugin menu, and as it is greyed out it won't do anything. Same here, Imagenomic Portraiture is a real timesaver for a lot of my portraiture work. First time caller here, just got Affinity Photo, very nice, but none of my plugs really work. I think that's because I have no idea where the support folders are on my mac. Perhaps someone could publish the usual (default) support directories for the most popular plugs? The ones that I use most are Nik and Topaz, and sometime Vertus Fluid Mask (although not that much anymore). Thx! Just curious - your posts about Portraiture led me to look at the Imagenomic web site. A lot of $$ for something that doesn't look all that different to what AP does with frequency separation. As I say, I'm just asking out of curiosity (and perhaps to find out what I'm missing!). The developers posted on this forum some time ago telling us to use / as the support folder. Just navigate to MacIntosh HD and select that as your support folder. As for the plugins, I use Topaz and some of them work, some do not, and sometimes repeated calls will cause a crash. The developers have promised that this functionality will be fixed in the next couple of beta releases. Maybe it is better to inform, somehow, the plug-in developers (Topaz, Alien Skin...) that there is a new player in the game and that they must take this in consideration? I am reasonably sure that the plugin manufacturers probably think the other way - that the pixel editor developers need to conform to their plugin interface. When I spoke with the Athentech (PerfectlyClear plugin) developers (during a support request) that was their response to me. I would just like to add my encouragement to the developers to fix the problems with the plugins. Sometimes, I think that the main purpose of Photoshop is to serve as a substrate for the amazingly powerful and clever capabilities of the best plugins. I am eager to switch over to Affinity Photo (for astro photography), but can't do it until AF can reliably run plugins, especially those from Topaz. Shame, about the lack of full implementation of the NIK plugin suite. Thankful for what I have but i have to resort to Elements to get them all. this means swopping between both products if I need to. Can not wait for the update, this plugin is important to me and it certainly helps the rounding Photo. I do not disagree as I have Topaz plugins (not all, but some) and also want them to work properly. However you can get Topaz's photoFXlab app/plugin and this does work with AP. In fact, once photoFXlab has opened you can then run all of the Topaz plugins from that platform and they all work properly. For example AP will not even run ReMask 4 but, when I open photoFXlab from AP and then run ReMask 4 it runs perfectly. I am not suggesting this as a long term solution. AP needs to get the plugin functionality working properly, but this will serve as a temporary work-around and I use it that way when I call the plugins that do not work. The problem is that the plugin installers often install files in specific places and only for Adobe products. If we don't get support from plugin developers then how do we get around that problem. 3) I still have photoLine on my system and it runs every plugin that I have added to it on my system so their location should not be an issue. I have added the plugin location from /Library and from /Applications to photoLine and the plugins just work. The same is true for Athentech's PerfectlyClear. I added it to photoLine and it just works, so they will run properly with apps other than Photoshop and Elements. I am not saying I want to use photoLine rather than Affinity Photo. I do not. But it seems clear to me that these plugins can work properly with a pixel editor other than Photoshop or Elements. I am sure that if the photoLine developers can make it work, then so can the AP developers. They have done everything else so very well. For all I know there may be hidden issues in getting the plugins to work but if they will run properly with photoLine I do not see why they can not run with Affinity Photo. One other comment. Months ago I suggested that the AP developers add the ability to run external applications from within AP, not just plugins. If they would do that much of this issue would go away because the Topaz plugins (and many others) can be also run as external apps or using external apps (like photoFXlab) and then the plugin would be either no problem or a much less pressing problem because an alternate method of running them would be available. I am not complaining about AP. I think it is a great pixel editor and I am very happy with it, but it will never become a truly universally accepted pixel editor on par with Photoshop without the ability to run plugins and so this is important to me because I want to continue being able to use Affinity Photo for the foreseeable future. I really like it and want it to be the best it can be and to become very, very popular and that will require the ability to run plugins so they do not crash. I have followed the help file instructions repeatedly using various folder locations and can not get any Topaz plugin to even show up in the AP beta plugin menu. 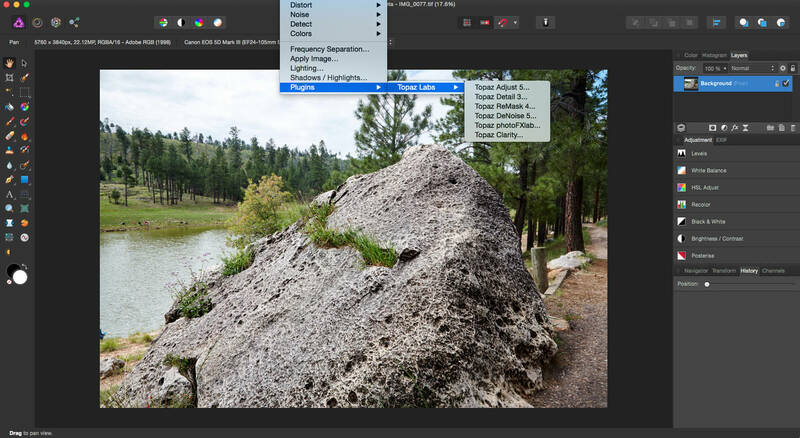 I have 5 Topaz plugins (Adjust, Clarity, Detail, DeNoise and ReMask 4) and they all show up in the Filters dropdown. ReMask will not launch and Clarity can only (generally) be run once before something starts crashing all of the other plugins, but Adjust and Detail do well. I also have photoFXlab (which I really don't like) and it will run as a plugin. The only advantage is that when it runs I can run all of my other Topaz plugins through it, even ReMask, repeatedly and they all run properly. Have you set up the folders properly? Here is a screen shot of my setup. And here is a screen shot of my Filters dropdown menu.